The Unicomer Group umbrella is expanding in Barbados as they officially launched Radio Shack this afternoon. It joins Courts and Courts Optical as the Unicomer brands trading in this market. Managing Director, Trisha Tannis, says the event this afternoon was significant as it was actually the re-launch of “the Shack” as the brand was previously in Barbados. Regal Forest Holding Co. Ltd., parent company of Unicomer, acquired the Radio Shack franchise for Central America, South America and the Caribbean in 2015. “Unicomer currently owns and operates 66 RadioShack stores in Curacao, El Salvador, Panama, Honduras Nicaragua and Trinidad. The opening of this store in Barbados meets the expanding technological needs of the evolving digital world in which we now live,” Tannis said, describing the move as a step in the right direction. The RadioShack brand has hit hard times in the USA, filing for bankruptcy in March and announcing the closure of some 200 outlets initially. Several media reports attribute the difficulties to the competition faced from online retailers such as Amazon and BestBuy. However, according to Tannis, there has so far been an “overwhelming” response from the public to the local store which opened its doors last Tuesday. With a staffing of just about five persons in the branch at Sheraton Mall, located adjacent to Courts, Tannis says they have brought first-class gadgets, electronics and accessories to Barbadians at a reasonable cost and they intend to keep good service to their customers as priority. 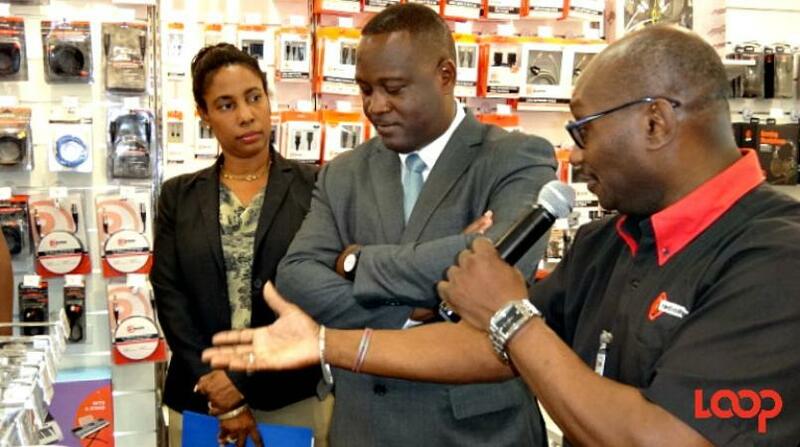 Minister of International Business, Industry, Commerce and Small Business Development, Donville Inniss, says he is glad the “Shack is back” and that Barbadians now can limit getting loans to go overseas to shop for some of the same innovative gadgets found in-store. According to him, some of the items are “cheaper than overseas”, providing Barbadians with another alternative to online shopping for getting items quickly and at a reasonable cost. He says it is significant that at a time when the conversation is about the fiscal challenge and the state of the economy, that there are those who maintain the faith and confidence in Barbados and the country’s brand. “I think Unicomer is a shining example of what many in the private sector should be doing in terms of finding their own space, finding opportunities and I would reflect on the fact that we have the fusion of two great brands (Unicomer and Radio Shack),” he cited.